Forecast for a decent North Easterly so went for the number 3 on the first beat up the Solent to the Forts. Made up some good ground round to Bembridge then got the heavy weight kite up all the way round the back of the Island. Jibed at St Catherine's and it got a bit more hairy but only one minor broach. 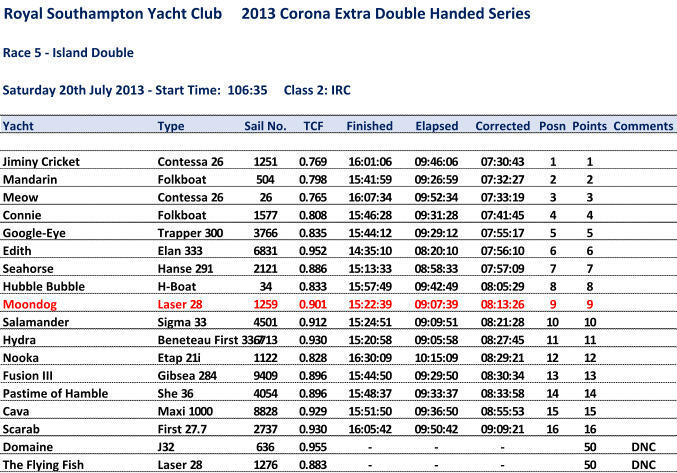 As it was a pretty quick circuit of the Island we had to plug tide most of the way back up the Solent to the finish. Initially we went to the Island side but as the rest of the fleet crossed over to the mainland side we followed them over. Tide turned not far from the finish and weren't that far behind the bigger boats but as usual the low raters came through on the tide and pushed us down the standings top ninth.